On the 12th October 2017 the Payload Asia Awards returned for its sixth edition with more than 90 nominations vying for 20 awards categories and with more than 25,000 online votes received in the Customer Choice Awards. The Annual Awards ceremony and gala dinner was held in Singapore and looked to honour the very best in the industry. 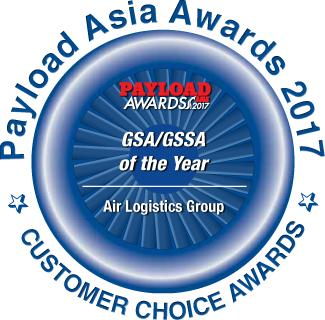 We are pleased to announce Air Logistics Group was voted winner of GSSA of the Year 2017, in the Customers Choice Awards. “We would like to take this opportunity to thank our employees for all of their hardwork and dedication. We feel that the combination of expert local knowledge and the strength of a financially well backed corporation is key to the success of Air Logistics Group.” Dawkins concluded.